Extra garden veggies? Pickle them! 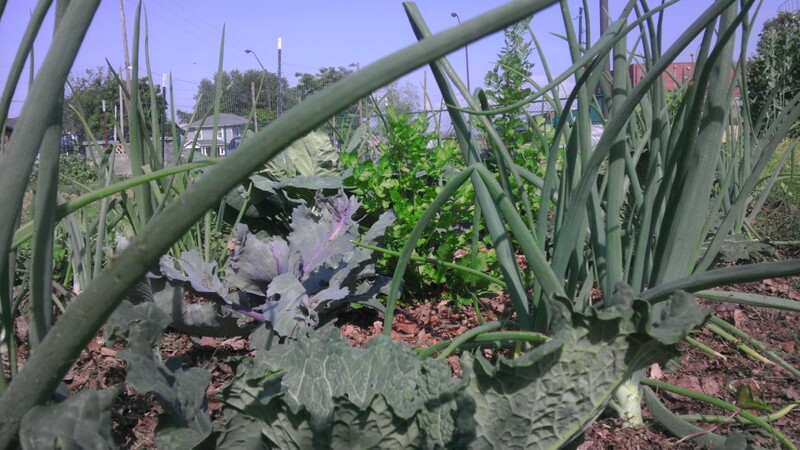 All the recent rain has caused our community garden plot to flourish. Lexy here from East Tennessee. I have a confession to make: I’m obsessed with lacto-fermentation. There are definitely times when multiple shelves in my fridge are filled with jars of homemade pickles. Since we’re heading into the summer months, when garden produce is overwhelmingly abundant, I thought I’d share this with you. 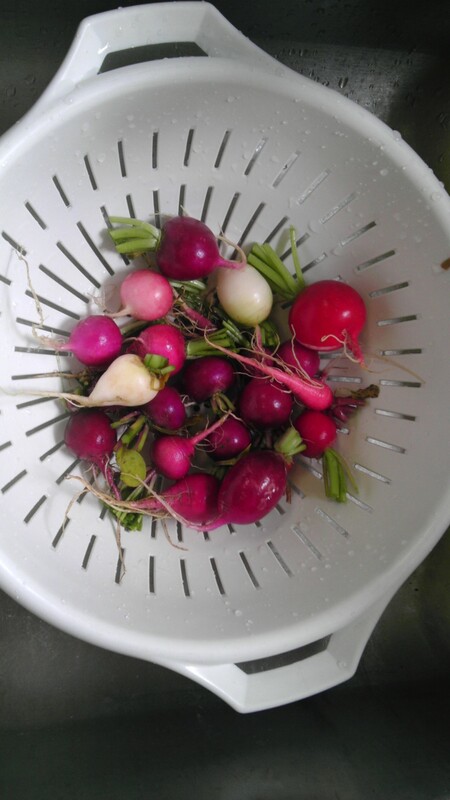 Our community garden plot is currently popping out radishes, so what follows is a radish pickling recipe. You can pretty much lacto-ferment any vegetable, so don’t be afraid to try this with anything you have a bunch of. Last year, Build It Up hosted a pickling workshop with our partners at Shakti in the Mountains (a women’s community organization in Johnson City) and it was one of our most popular. We just had a great meeting with Shakti to plan another series of food and gardening workshops. So far we are planning pickling/kraut making, container gardening, backyard bees, low cost chicken coops, and oyster mushrooms in buckets. I’m looking forward to planning a summer of workshop fun! Anyway, back to the radishes. Radishes come in a range of awesome colors. Give them a rinse to knock off the dirt, but don’t be too thorough. The radishes are covered in microscopic colonies of bacteria, some of which you will harness during the lacto-fermentation process. Don’t be obsessed with sterilization. Embrace the life already on your food! 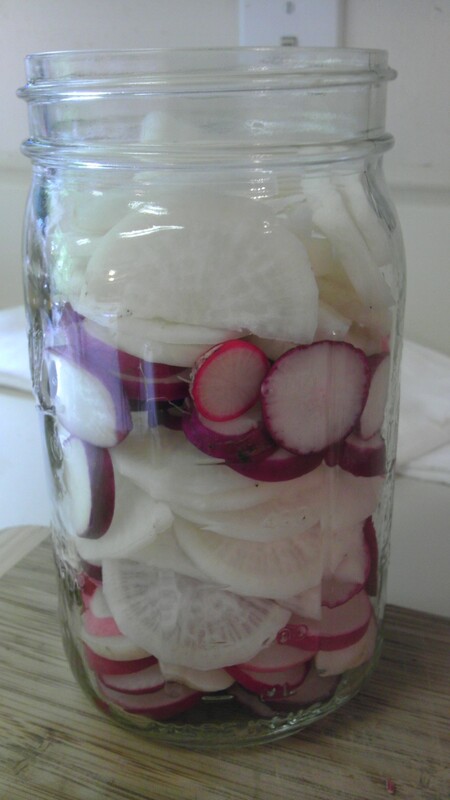 Slice up your radishes and stuff them into a clean–but not sterilized–wide mouthed quart jar. Layer the colors so it looks extra spiffy. Radishes come in all kinds of shapes and sizes. This one is a mixture of radishes from our garden plus a giant daikon radish I had left over from sushi night. Lacto-bacteria (the kind that make awesome pickles) thrive in a salty environment, whereas yucky bacteria (like the kind that make compost) are killed by the salt. The salt inhibits the yucky stuff and allows the good guys to eat the sugar in your veggies and convert it to lactic acid. Not only will you have jars jam packed with probiotics, but you will also preserve your food without the use of heat or chemicals. I generally add 1-2 tablespoons of celtic sea salt per cup of non-chlorinated warm water to create the brine. The amount of brine you need will depend on how many radishes you have stuffed into the jar. Feel free to add spices, like black pepper, coriander, red pepper flakes, or whatever you have sitting in the dark recesses of your cabinets. I often stuff garlic cloves into my pickles, because garlic is super awesome. Try whatever strikes your fancy. Fill up your jar with the brine until it’s about an inch from the rim. Press the radishes so they are submerged below the liquid. Lightly screw on the lid and place the jar in a cool, dark location. Check it every day, making sure to unscrew the lid so the carbon dioxide from the fermentation process can escape. If weird things appear on the surface, don’t panic. Just scrape them off and use this as a sign that your pickles are ready to go into the fridge. Most of my pickles are good and bubbly by day three, but yours will vary by the conditions in your location. 2-5 days should do, though. Let them chill in the fridge for 1-2 weeks. Start tasting them after a week. Are they crunchy, sour and awesome? Great! You made pickles! The flavor will change over the coming weeks, so make a bunch and savor eating food that is alive. Six months is probably the upper limit on their lifespan, but use your senses to judge if a jar has gone bad. Have you run a fermentation workshop before? What did you make and how did it go? Author: Lexy Close is a program leader with Build it Up! East TN. This entry was posted in Local Initiatives, Local Programs and tagged Build It Up ETN, fermentation, Johnson City, pickles, Shakti in the Mountains, Tennessee, workshops by lexyclose. Bookmark the permalink. Visit Uncle’Rob’s Garden Fresh Produce at the Jonesborough Farmers Market, Sat from 8-noon next to the court house. Just follow the signs. I’ll have bunches of home grown radishes this coming weekend. Just planted lots more BTW.. Thanks, y’all! You really can do this with any vegetable. My favorite is dilly beans (green beans and garlic)! I love making kraut and kimchi too. Yum! This is awesome, Lexy! We had a friend teach us how to make sauerkraut last year and it was so much fun! We’ll have to do this with our radishes this summer. I definitely have to try this- local radishes are good pickin’ from our Farmers Market but I never have any ideas for ’em beyond salads!